Could forming a purpose with others help you live longer? 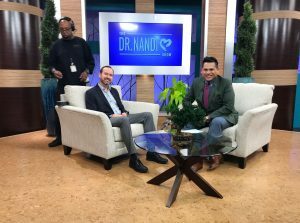 The Dr. Nandi Show is a medical lifestyle tv show whose mission is to improve the health of America and the world with compassion, empathy, and integrity. Dr. Partha Nandi is a practicing gastroenterologist, internal medicine physician, holistic health practitioner, and patient advocate. White is the managing director of the Center for Positive Organizations. He co-developed and teaches the MBA class on social intrapreneurship and is co-author of Changing Your Company from the Inside Out. The episode is scheduled to air on on WXYZ Metro Detroit Sunday, November 11, 2019 at 5:00 p.m. ET.